The Story: Edison’s investigation into the buyout of Security Systems, Inc. gets him in dutch with A-7, the information-gathering company’s artificial intelligence. Framed for credit fraud, Carter and his colleagues are soon on the run from the ever-present Securicams. 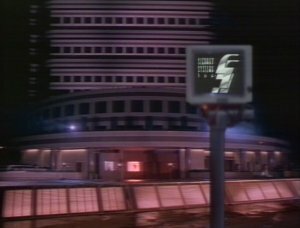 The only way to clear Edison’s name is to break into Security Systems’ HQ…but Max Headroom has a little trouble pulling out. Behind the Screens: Admittedly, this one is more than a bit silly, especially once Max meets A-7 and love blooms. In addition, it must be said that, for an all-powerful surveillance firm, the Security Systems complex is oh-so-easy to penetrate. I suppose there’s a point here about the arrogance that comes with omniscience, but you’d think the corporate culture at SSI would be considerably more paranoid. Part of the fun of this episode is that it gets most of the regular cast out of the Network 23 offices and brings them face-to-face with Dom and Blank Reg. 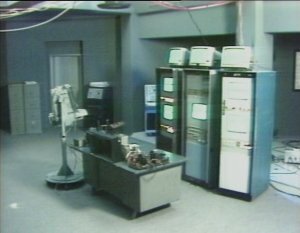 Theora still spends a good portion of the episode fretting at monitors, but at least they’re different monitors. There’s even a low-tech Ocean’s 11 sequence in which our Rat Pack uses BigTime Television’s low-watt transmitter to hack into SSI’s mainframe. 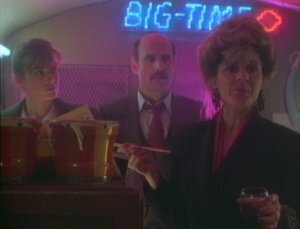 Theora spends much of the first half of the episode being pissed at Edison and Murray over not letting her in on a plan to “crash” Network 23’s news chopper onto a restricted helipad. (They wanted a realistic reaction from her during the ginned-up crisis.) In return, she damned near smacks off Murray’s head during a fake lovers’ spat intended to distract an SSI gate guard. This time the show was right on the money. Data gathering, online privacy and identity theft (or, in Edison’s case, identity manipulation) have all become major concerns for us. Edison’s plight–false evidence planted and credit ratings zeroed out–came eight years before Sandra Bullock starred in The Net. On the other hand, the computer bank which houses A-7 is more hilariously outdated than usual. It doesn’t have reel-to-reel tapes, but it might as well have. The Commodore 64 had already been out for five years by the time this originally aired, so it seems strange that the producers were still thinking in terms of big, honking stacks of circuits topped with half-a-dozen redundant monitors. I suppose it could be an intentional part of the show’s retro-future aesthetic, but I kinda doubt it. And the less said about Max and A-7’s virtual kissy-face, the better. 31 (Japanese) Monsters #1: Guiron What An Amazing DVD Set For The ALF Fan!